Is Your Snow Plow Ready For Winter? A Pre-Season Plow Inspection Will Make Sure It Is. The changing of the seasons is as evident by the leaves turning into a brilliant array of colors as it is by the fall to do list that each of us has before the first flakes of snow arrive. Whether the list includes cleaning the gutters, trimming up the landscaping or getting your snow plow ready for the upcoming season, each task has a purpose and necessity in preparation for old man winter. Performing a pre-season plow inspection on your snow plow is a yearly practice that is recommended to perform any needed maintenance work prior to the first winter storm warning. If you installed your snow plow by yourself, you probably will perform this pre-season check on your own. However, for those that had your snow plow dealer do the install or prefer to have another set of eyes look over the plow, many dealers offer a pre-season plow inspection for a minimal cost.  Changing the hydraulic fluid.  Greasing the vertical pin (on v-plows) and other important wear points.  Clean, inspect and grease all electrical connections.  Check all nuts and bolts for tightness.  Tighten the trip and return springs.  Inspect all welds in plow structure and vehicle mount. 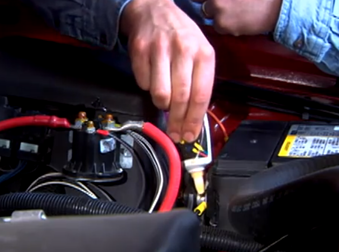  Inspect and re-torque all fasteners on the vehicle mount.  Inspect the lights and properly adjust and align the plow lights.  Make sure all plow functions work properly. Taking the time to have your plow serviced before the storm will assure you that your snow plow is ready to go at the first sign of winter ahead.